Lighting pictures is a great way to accentuate the color and detail of your artwork. Many homeowners are victims of the myth that natural sunlight is the best way to illuminate pictures. Nothing could be further from the truth. Ultraviolet and Infrared radiation from the sun can damage your artwork and turn a picture lighting project into a complete disaster. Insufficient light fixtures do not make up for this problem. Many bulbs produce ultraviolet radiation and can produce the same type of damage that would occur if you left your pictures hanging under natural sunlight. At Grimaldi Electric, we recommend that you get quality picture lights that are safe for your art work. One Method of illuminating your artwork is with recessed lighting. 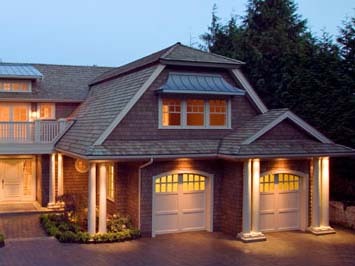 Pin lights with MR 16 bulbs or recessed fixtures with gimbal and eyeball trims are frequently used to accomplish this. 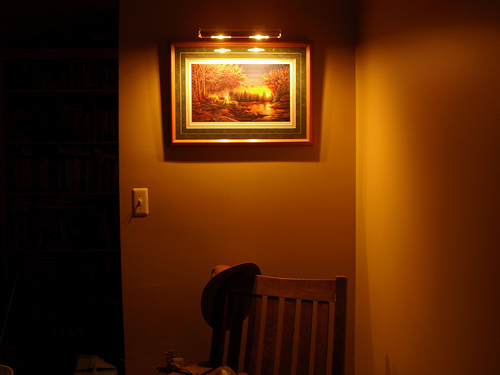 Most art galleries, consultants, and homeowners tend to use surface mounted lights. These lights are cord and plug connected and attached to the frame of the artwork. Our Electricians place the receptacle behind your painting, hiding any unsightly cords. We also like to install a switch, making it simple to control the outlet for your frame mounted picture light. Picture Lighting brings life to your artwork and adds a touch of soft brilliance to your home environment. Let Grimaldi Electric add life to your New Jersey home. At Grimaldi Electric, we see a lot of bathrooms with inadequate lighting; often there is just a single ceiling fixture illuminating the entire room. As the bathroom increasingly becomes a place to relax and recharge, complete with a steam shower and spa tub, the lighting requires extra thought. And when it's done right, the payoff is great. A good bath lighting plan is a series of layers — placing ample light where it is needed for showers, shaving, or putting on makeup, while other light sources enhance the overall mood of the room. Vanity lighting gets top consideration because these fixtures work the hardest to illuminate the head and face for grooming. The most common mistake people make is putting recessed ceiling fixtures directly over the mirror. These cast shadows on the face, making daily grooming more difficult. Fixtures or sconces mounted on either side of the mirror are best for casting an even light across the face. If lighting on the sides of the mirror is not practical then we would recommend a light over the mirror placed about 80 inches off the floor. Make certain that the vanity light fixtures you select provide more than enough light. One of the simplest techniques that you can use to ensure that you will always have enough light is to over light the space, and then use dimmers to control the amount of light that you want or need at any given moment. Halogen bulbs will provide a crisp white light that tends to render skin tones most accurately. The shower is a secondary area of task lighting. In most of our bathroom electrical installations, we recommend a recessed light with a glass lens. Similar recessed fixtures work well over whirlpools, air tubs, freestanding tubs and toilets. 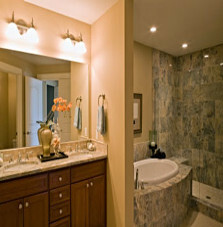 Dimmers are a must for providing control over the lighting and thus, the mood of your bathroom. Plus, dimmers conserve energy. The total savings depends on how much you dim the bulb, but one dimmed just 10 percent will last twice as long as a bulb at full brightness and use 10 percent less energy. We must not forget ventilation. Bath fans are important in removing moisture from your bathroom which helps to prevent mold growth. Many of our Monmouth County customers request ultra quiet fans such as the Panasonic. Most fan manufacturers also provide bath fans with heaters and light options. Safety is always the most important aspect of any electrical installation. Electricity and water are lethal companions, and nowhere do they mingle more closely than in the bathroom. 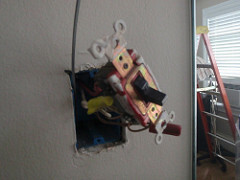 Always consult a Licensed Electrician before tackling even the simplest lighting project. Whether you're building a new home or renovating an old home, recessed lighting can be a key element in both the function, comfort and style of the space. Recessed lighting offers a clean, streamlined look in a home. It can increase the amount of light in a room, highlight artwork or other special features, and open up spaces so they look and feel bigger. Recessed lighting can be layered with wall sconces, chandeliers and task lighting to give depth to the space you are finishing. Though recessed fixtures are most easily installed between ceiling joists, some recessed fixtures are designed specifically for retrofit applications and can slip into an existing ceiling space through holes made to accommodate wiring; however, the fixtures you choose must be rated for use near insulation (IC housing rated) whenever ceiling insulation is present. When a ceiling is uninsulated, a non-IC housing may be used. Match the size of your recessed lighting fixtures to how close together they can be installed. Center recessed lighting fixtures in front of the objects you wish to light - a painting, bookshelf, or drapery panels, for example - and about 12 to 18 inches in front of that object. When lighting a three-dimensional object such as a fireplace, sculpture, or flower arrangement with recessed lighting, it is more effective to light it from several different angles. Whether you choose fixtures with standard line voltage, low voltage halogen, or fluorescent fixtures, the basic sizes are 4-, 5-, or 6-inches in diameter. The 6-inch fixtures can be used in general applications, while the smaller 4-inch sizes work better in smaller spaces since they have a sleeker, contemporary look with minimal intrusion. Adjustable recessed light eyeball fixtures can be aimed at artwork as accent lighting. Cover the walls with light by selecting recessed wall washer fixtures. Choose recessed reflectors when you want the most light from a fixture, or install white or black baffle trims to focus and direct light or reduce glare. At Grimaldi Electric, our Professional Electricians can handle all your Electrical Trouble Shooting and Electrical repairs. Do you have a GFCI outlet that is not resetting? Are your lights flickering or dimming in an area of your home? Do you have an outlet not working or working intermittently? Are you blowing fuses? Do you have a problem electrical circuit breaker that keeps tripping? If you answered yes to any of these questions, then let the electrical troubleshooting experts at Grimaldi Electric of Monmouth County work to fix all your electrical problems. At Grimaldi Electric, we have years of experience with troubleshooting electrical switches, electric plugs (outlets or receptacles), lights, electric wires, ceiling fans, appliance circuits, dimmers, and electrical equipment connections. Our courteous electricians will safely troubleshoot and repair all of your electrical problems. Electrical problems occur for many reasons: poor installation, outdated and old equipment, high use areas, etc. Avoid homemade, potentially unsafe do-it-yourself repairs. Proper electrical wiring must be done by a licensed electrical contractor, since faulty electrical wiring can cause unpredictable damage, including fire. Call Grimaldi Electric today for all your electrical troubleshooting and electrical repair needs! Electrical troubleshooting is just one of the many electrical services we offer. Don't have enough power in your home? Maybe it's due to your undersized electrical panel. We can replace your 50 amp, 70 amp, and even 100 amp outdated electrical service panel or fuse box with a new 100 amp, 150 amp or 200 amp service panel. 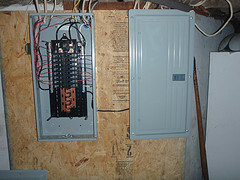 An electric panel upgrade or Service Upgrade is an upgrade from your homes existing electrical panel. With all the new appliances, hot tubs, pools and other electrical devices we now have in our New Jersey homes, we find that older homes might not have sufficient power available to handle the increased demand. Therefore, a "service change" is required. This includes not only an upgrade in your electric panel but an upgrade in your meter socket, service entrance cable, electrical breakers, main ground, supplemental grounds, etc. Do you have one of those Federal Pacific Electrical Panels? Many of our Middletown and Monmouth county customers are familiar with these panels and their hazards. Federal Pacific lost their UL listing because of failures with the panel breakers. Sometimes there is sufficient service to your home, however there is a problem with just your electrical panel, Federal pacific for example. In this case a "panel change out" is usually required to alleviate the problem with the existing panel. A panel change out is also appropriate when a breaker overheats to the point that the buss bar in the panel gets burned or maybe the conductors between the meter and panel become loose and burn out the main lugs. In most homes, the kitchen reigns as the most-used room in the house. With not only cooking, but homework being done at the counter or table, reading and writing going on, and a host of other activities being performed. Consulting your electrician before and during the design of your kitchen project will help avoid some common problems and keep your project running smooth. One of the most common lighting layout errors we see in the Monmouth County, New Jersey area is attempting to light your kitchen with one ceiling fixture mounted in the middle of your room. Many times a single light source becomes a glare any time you look into the kitchen, but more importantly you don’t get the light you need on your countertops. Every time you bend forward to do work on your countertops you are working in your own shadow. Another common design error is not planning for adequate wall space to locate your lighting controls. Many times a full height refrigerator end panel or a tall cabinet is placed too close to the entry, leaving no space to install switches and dimmers. In general, a good lighting scheme can be achieved by layering, which consists of mixing various types of fixtures to create a comfortable space. 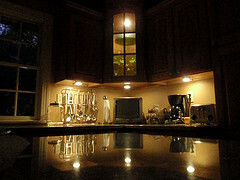 There are several types of lighting that can be used in layering your kitchen lighting. These are task, accent, ambient and decorative lighting. The task lighting focuses light on the work area. Task lighting is usually situated between the work surface and the person running the kitchen. In most cases, under cabinet lighting is used to light the countertop work surface. Accent lighting, as its name denotes, accentuates the whole kitchen and adds dimension and depth to the whole space. An example of accent lighting are the fixtures placed inside a glass cabinet to spotlight china and glassware. The most overlooked kind of kitchen lighting is the ambient lighting. Ambient light is the general, overall light that fills in shadows, reduces contrast, and lights vertical surfaces to give the space a brighter feel. Ambient light is what you need for casual activities in your rooms. If the kitchen has light colored surfaces and lots of windows you should have plenty of natural ambient light during the day. Most people don’t think that they need extra lights to create a soft yet warm glow that soften shadows but as soon as they realize this, they acknowledge that the ambient lighting creates that homey feel that was missing in their kitchen. The last type of kitchen lighting is the decorative lighting. Decorative lighting adds zest and sparkle to your kitchen. With decorative lighting, make sure not to overdo it. It can make your space look overdone and cluttered. Many light fixtures provide more than one function, for example: a decorative light over the kitchen sink may also supply task lighting. Grimaldi Electric of Red Bank, has installed lighting in countless kitchens throughout Monmouth County and New Jersey. Let us help you with your dream kitchen. 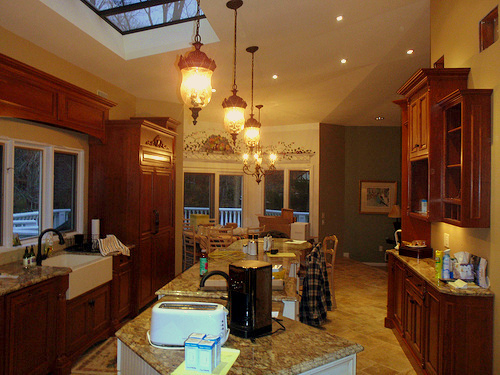 This beautiful Holmdel, NJ kitchen has pendants, low voltage recessed fixtures, and low voltage halogen lights. Smoke detectors are a wonderful tool to help keep your loved ones safe. Smoke Alarms need no maintenance other then cleaning off the dust and cobwebs, a monthly test, and changing the batteries. The batteries should be changed at least once a year. Here in Middletown, NJ, I have heard many fireman suggest changing the batteries in your smoke detectors when you adjust your clocks for daylight savings time. This is a great way to remember to change the batteries in your smoke and carbon detectors twice a year. 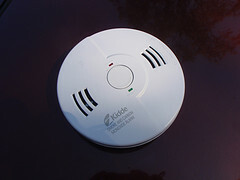 Studies have concluded that when working smoke detectors are present, the chance of dying from the fire is cut in half. However, it has also been estimated that a third of smoke alarms that are in place are not working due to worn out batteries. Many of the communities surrounding our Red Bank office require installing or upgrading your smoke system when you sell or expand your home. Please make sure your home has a smoke alarm system in place and that it is being maintained properly. This might seem like a do it yourself job to some people at first glance but stop and think about the idea that a 25 pound metal and wood object will be suspended over your head for years, while spinning...maybe it's better to let a professional handle this? A ceiling fan requires specific hardware to be mounted properly, and because of the constant vibrations and motion, the wiring to the fan must be done right. With literally thousands of ceiling fan installations in Monmouth County under our belt, we can install a fan safely, in any part of your home. Your fan will likely be there for years to come, a professional installation is a good investment. Speaking of investments, a ceiling fan will provide a great return by increasing your comfort in the hottest and coldest times of the year. A common misconception is that ceiling fans lower the temperature in a room. Fans do not change the temperature in a room like air conditioners, fans only move air. In the summer, a fan's direction should be set so that air is blown downward. The breeze created by a ceiling fan make us feel cooler by speeding up the evaporation of perspiration on human skin. Since the fan works directly on the body, rather than by changing the temperature of the air, during the summer it is a waste of electricity to leave a ceiling fan on when no one is in a room. In the winter, ceiling fans should be set to turn in the opposite direction and on a low speed. A ceiling fan, with its direction of rotation set so that air is pulled upward, draws up the colder air below, forcing the warmer air near the ceiling to move down to take its place, without blowing a stream of air directly on the people in the room. This action works to even out the temperature in the room, making it cooler nearer the ceiling, but warmer nearer the floor. Pull Chain/pull-cord control. This is the most common operation for household fans. This style of fan is equipped with a metal-bead chain which, when pulled, cycles the fan through the operational speed(s) and then back to off. These fans typically have three speeds. Wall-mounted control. Some fans have their control(s) mounted the wall instead of on the fans themselves. These can be simple switches or specialized fan controls. Wireless remote control. In recent years, remote controls have become an affordable option for controlling ceiling fans. 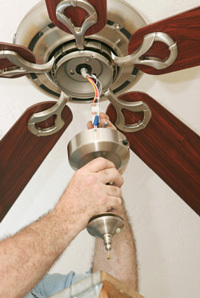 While some models do employ this as their sole form of operation, it is more common for a person to purchase an after-market kit and install it on an existing fan. When selling or buying a home you should be ready for the home inspection. Chances are good that prospective buyers are going to want your home thoroughly inspected by a professional home inspector on their behalf and corrections completed on all code violations. After all, buying a home is no small investment and most buyers want to make sure they are purchasing a sound investment. You will need Grimaldi Electric, your licensed Monmouth County, New Jersey Electrical contractor to look into your home's electrical system to make sure everything is in order. Realize that a poor report from a professional home inspector can have a huge impact on the sale of your home. We recommend fixing the electrical violations in your home immediately. The code violations are going to have to be fixed so why not make your home safer for yourself now and repair the violations that may scare away potential buyers in the future. Have our certified, licensed, and insured electrician inspect your home, do any repairs and bring your violations up to electrical code before you invite prospective buyers (and their home inspectors) in.